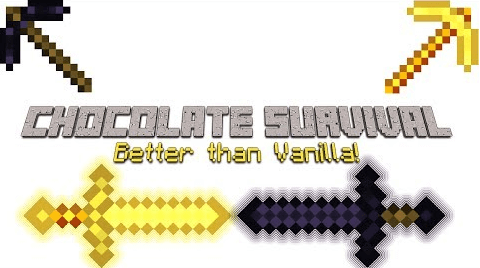 Chocolate Survival Mod adds to the experience of Vanilla Survival,contains new tools, items, blocks, and crafting recipes. It is designed to make Vanilla survival more fun and exciting while still keeping it balanced. Iron Nugget, used to craft Chain armor. Compressed Lapis, smelt to make a diamond. Chocolate, eat and get Speed II for 30 seconds. Lambchops, sheep drop them and they are tasty. Hard-Boiled Egg, cook an egg to get this protein packed food. Obsidian tools, they don’t take durability, but are slow. GodGold tools, the best tools in the mod, but expensive to make.